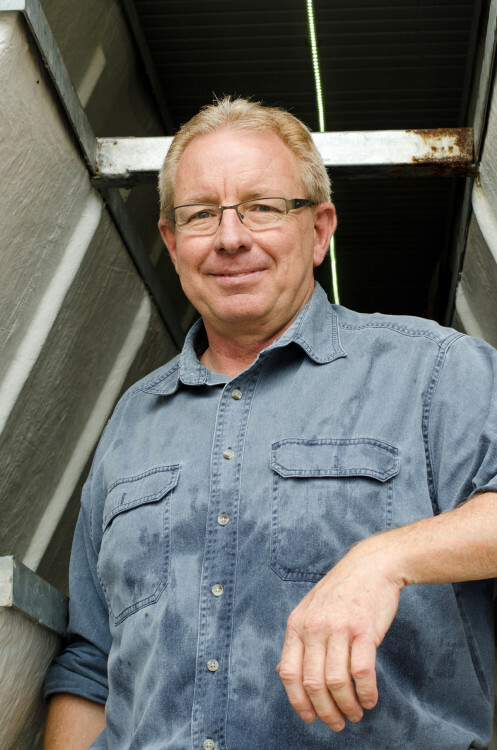 As soon as Alan Fleming scatters the fish pellets, the tilapia in the tanks rush to the surface, splashing water in the narrow space of a metal shipping container. His fish farm prototype, aptly named The Fish Farm is situated within the grounds of The Business Place, a non-profit centre that aids local business start-ups and entrepreneurs in impoverished Philippi, Cape Town. 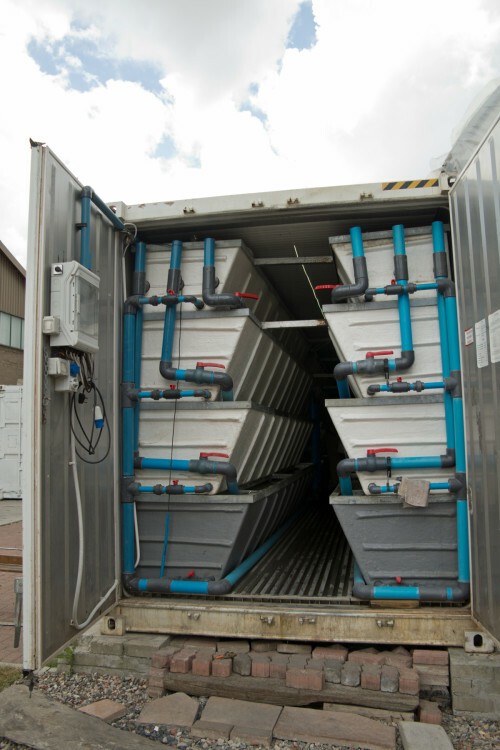 Within an insulated 12-metre container, three levels of tanks along the length of both sides house tilapia nilotica and mossambicus in the summer, and trout in the winter. Both species are hardy and quick growing, essential qualities when you’re working with learner aquaculturists, like they do here. With 5.2 million unemployed people in South Africa, The Fish Farm is a proactive project designed by Fleming with the view to transforming communities. As a director of The Business Place, who’s seen its growth from a wasteland 10 years ago, into a creative and strategic space today for entrepreneurs from the community, he is concerned about these figures. “If we don’t do something quickly, we will be swamped by a tidal wave of unemployed people, with no purpose. We are all occupational beings and we thrive when we contribute,” he explains of his motivation with the project. With a background in environmental science, agriculture and construction, Fleming’s role has over the years changed, “from an old-school capitalist to a social capitalist”, and his current role is focussed solely on non-profit work. 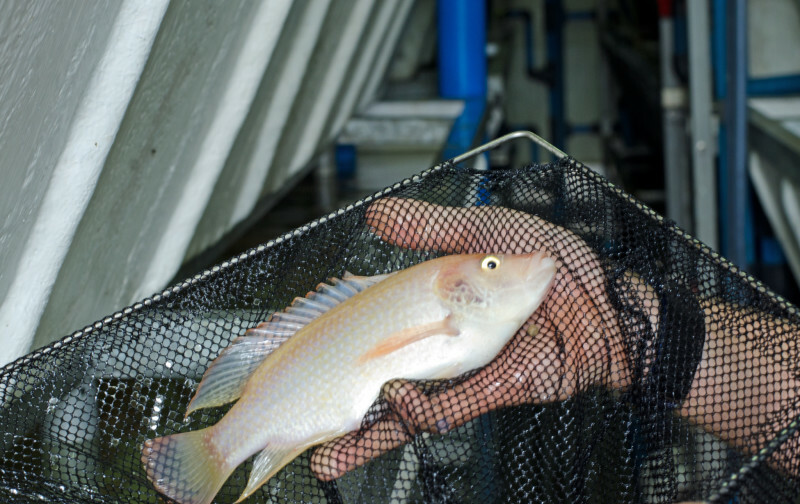 The critically low ocean stocks and the increasing need for protein production are other factors that prompted the development of The Fish Farm. $124 billion is spent annually to catch $70 billion worth of fish in the wild, he says. The figures point markedly at the scope for commercial fish farming. Placing a fish farm within the bustle of an urban area with its shops, schools, clinics and high-rises, as is the case in this section of Phillipi, may be difficult to imagine at first. Shipping containers have in recent years been used out of the growing need for space – as schools, storage facilities and businesses. 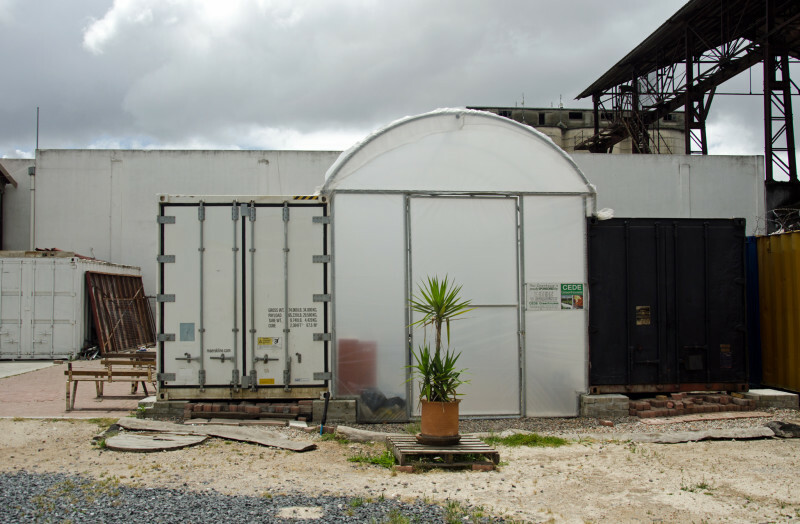 The Business Place had already, and with much success, utilised these containers as offices for start-ups. It made sense to Fleming to extend the shipping containers to the fish farming idea he had been working on for years. While fish farming tanks exist around the world, the model and purpose for this one is unique. A runner-up out of 800 entries from 90 countries in the Siemens Stiftung “Empowering the People” awards in 2013, the goal of The Fish Farm is to transform lives by creating a sustainable and environmentally conscious product. Together with gardener-turned-aquaculturist, Lungile Mafilika, Fleming put the model through its paces, ironing out issues along the way. It’s a modular and easy to replicate design, environmentally sensitive, micro-intensive and ready to plug in. According to Fleming, The Fish Farm is a model that is “profitable, affordable, repeatable, transportable, lockable and stackable”. Prospective famers from one of these poverty-stricken communities, often unemployed or performing menial tasks for payment, undergo a two-week aquaculture beginner’s course and a two-year business development training programme at The Business Place. An entity is set up within the community and the farmer or farmers are given support and coaching to run it. One container is able to generate Dh132 worth of fish per month (the difference between poverty and dignity, Fleming says), and one farmer can handle around five containers working in a fulltime capacity. “I’m changing the aquaculture industry in South Africa,” he says as we inspect the tank and the attached structure, an aquaponics system. Water from the tanks feed into it, and nitrogen-fixing bacteria break down the by-products of fish waste into nourishing nitrates and nitrites. Onions, lettuce, cucumbers and spinach flourish here, growing from evenly spaced holes in a pipe structure or suspended vertically from pipes attached to a wall. 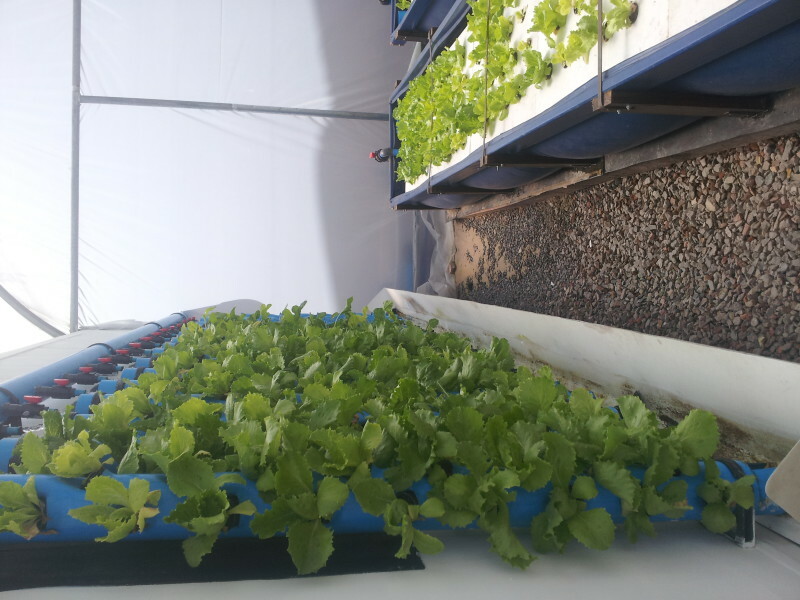 Working with aquaponic tunnels paired with the fish tanks, transforms the new recruit into both an aquaculturist and an urban farmer. “It’s relatively easy to go out of business with fish farming; the industry is highly regulated. It’s not a sliver bullet out of poverty. It needs to be supported, and that’s what we provide,” Fleming says. The aquaculturist starts his farming life as a contract grower at The Fish Farm, which also provides an offer to purchase back the stock. “I’ve got orders for around 60 tons of fish per month from local supermarkets, a Chinese chain of fishmongers and Zimbabweans that I just can’t supply yet. The potential for the urban fish farmers is enormous,” he states. While fully automated computer-controlled fish farms exists, the goal in this case is to create employment, and thus, The Fish Farm only employs simple technology by way of a chip that can notify the user by text message of dropping water levels. Water – quality, levels, temperature, circulation and overall condition is crucial for fish breeding. The other factors include the type of food used and the fish species bred. There’s scope here to extend the farming to crayfish. 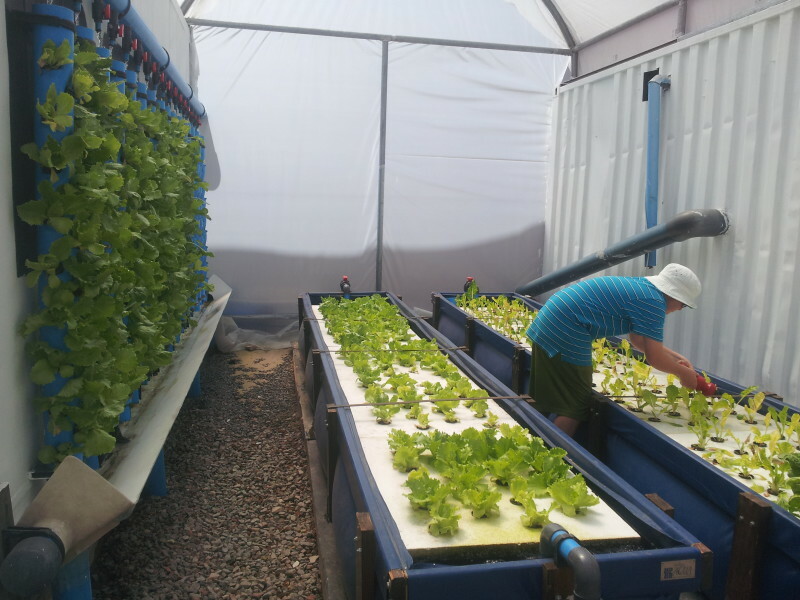 Onto its third (and ideal, says Fleming) prototype, the tanks have been developed to produce 4 tons of fish per year, and cost around Dh74270, or Dh102328 paired with an aquaponics tunnel. Money for the project is encouraged from enterprise development and philanthropic entities; a firm decision was made not to entertain venture capitalists. “At the end of the day it’s the farmer who sits with his neck in the noose,” Fleming explains. “There is around R12 billion (Dh363 636 364) available in enterprise development funds in South Africa, but they’re hesitant about where to place it. Often projects need repeat cash injections. But, The Fish Farm does not. It’s ready to go after the first investment,” he says. The Fish Farm receives regular emails from around the world about interest in replicating the model, and even the purchase of “storied” fish. 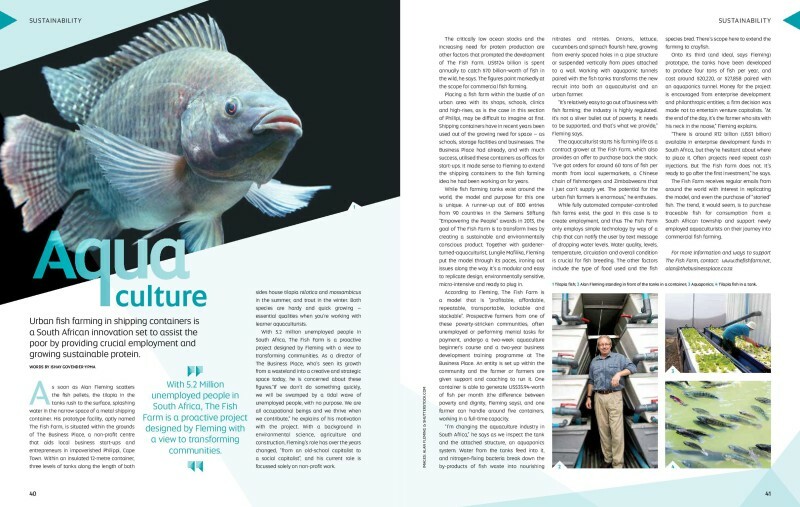 The trend it would seem is to purchase traceable fish for consumption from a South African township and support newly employed aquaculturists on their journey into commercial fish farming.